DESIGNED TO FIT THE TRX450R CARRIER. Radius notched for pinch bolt sleeves. Four square holes through relieved center section. Manufactured from 3-3/4" O.D. 1020 grade DOM steel tubing. Bored dia. 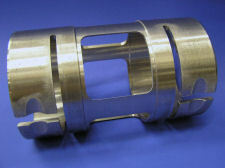 is 3.435" (87mm); Length is 6.122"